Sometimes all we want in life is to be told what to wear and where to get it. Because quite frankly the majority of us are too busy to be bothered looking. Which is kind of why we are in this unethical and unsustainable fashion pickle in the first place. We consumers often can’t be bothered to ask the tough questions or do hours of research just to buy ourselves a beach bag or a hat that has some kind of ethical or sustainable kudos. Which truthfully isn’t something to feel bad about because we should be able to buy items that are good for people and planet without having to ask about it (kind of seems like common sense really). However, that’s not the common practice in most big businesses because they make money out of lowest manufacturing costs and highest profit margins. Outcomes that result from low cost manufacturing that pays low wages (often below living wage) and not paying at all for environmental damages. Fortunately there are loads of online resources out there to help you help yourself shop for the good of people and planet. Sustainability in Style is one of them. For today’s post I thought it might be fun to ‘shop’ a few outfits that should help you to easily track down your very own consciously styled look. So kick back and relax (like the gorgeous Ettitude model above) and shop the look category by category. 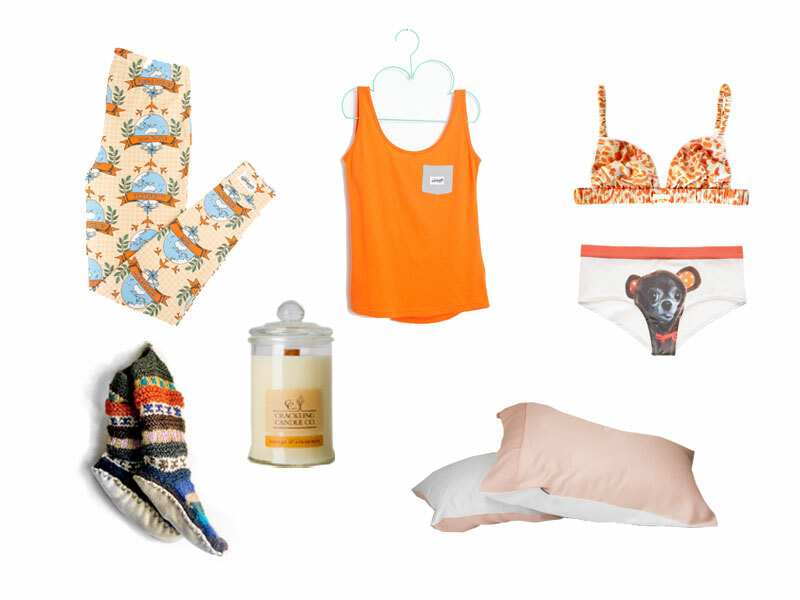 Catching some shut eye without the fashion nightmare. For some of us the ‘what to wear to bed’ question might be a little null-and-void (especially if you sleep in the nuddy). However there others out there that can’t imagine life without a decent set of PJ’s to lounge the weekend away. When you think about it, the average Pyjama-a-holic probably spends more time in their jammies than they do anything else, which is why we will start with our ethical and sustainable attire for slumber-land. The selection above are: Tibetan Socks Hand Knitted Long Socks $35 The Goodnight Society Let’s Jet Around Leggings $54.95 (on sale at the moment) and Watch Your Back scoop tank $39.95 (on sale at the moment), Ettitude Rosie Pillow Case Set $40, Madonna Bain Intimates Bam Bam bralette $35, Crackling Candle Co Orange and Cinnamon from $20, and Naja Chloe Kardoggian Cheeky Knicker $21.00. What to wear to the office. We all know that getting dressed for an office job can be a tad boring. However, you can use the office water cooler and your sweet threads to start all kinds of ethical and sustainable fashion discussions. And let’s face it, the day goes a whole lot faster when you can talk about your passion for fashion. The selection above is: Kowtow Boundary Dress $239, The Root Collective Eva Loafer $134.00, NICO Underwire Bra $80 and thong $25, ZINK Beatnik Large Pouch Blue IKAT $35, Loup & Co Cactus Necklace £24, and Flora Stationery Fauna No. 2 Notebook $12.99. 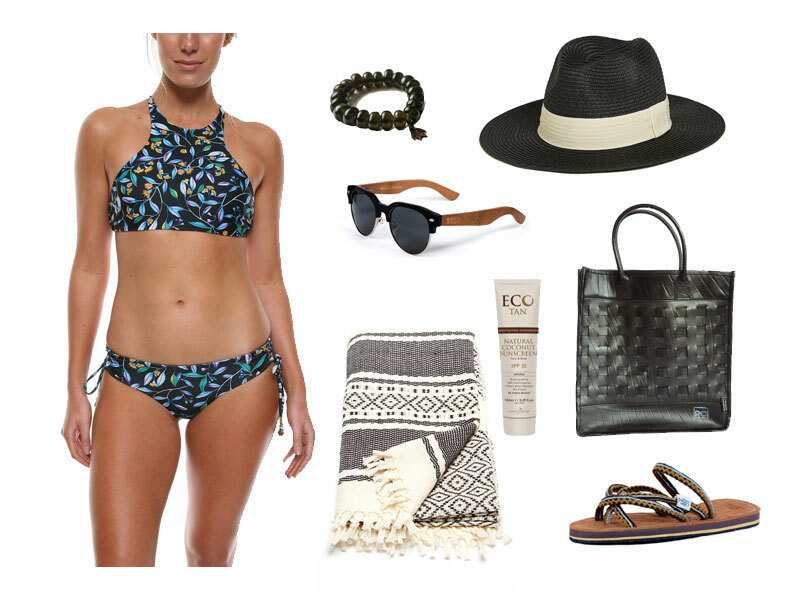 Us Southern Hemisphere folks are gearing up for the balmy days of summer (hey, it’s pretty much beach weather all year round where I live), so the following is a collection of goodies to help you enjoy your stylish beach adventures guilt free. This selection includes: Shapes in the Sand Blossom Dancer Cross Back Crop $109 and Reversible Cheeky Lace Up Pant $89, Wax and Cruz Ixchel Beach Blanket $148.00, Recycle Creative Moto Shopper Tote $61.20 (this guy is water resistant so perfect for the beach), SOLO Trinidad Sunglasses $89, Threads For Thought Say It Again Fedora $22, Sole Rebels Loop Magic $55.00, EcoTan Natural Coconut Sunscreen $29.95 and Turtle Warrior Recycled Glass Bracelet $47.02. Hope that these serving suggestions help your find ethical and sustainable options easily. Remember to research each brand to see if they fit your sustainable and/or ethical shopping values. Share your fave finds with us below.